THAT MORNING WE DECIDED TO work in a radically different way. No more collecting in the highlands of Chiriquí. No more collecting in the tall grasses around lakes where crocodiles lurk. We were determined to collect lady beetles, preferably those infected with ectoparasitic fungi, and for this we needed to into citrus plantations. It was a Sunday, so it would be hard to call the landowners. We took the chance and drove to a good plantation, with a beautiful sight on the mighty Volcán Barú, Panama’s highest mountain. Unfortunately, after five minutes—even though it was Sunday—the owner came by and chased us away. Luck was not at our side. We did some more driving until we saw an orange grove and its owner. With us was Juan Bernal, professor at Universidad Autónoma de Chiriquí (UNACHI), who reached out to the owner in his friendliest Spanish and achieved the result we needed: we could jump over the fence, intermingle with the many cows, and collect our lady beetles. Somewhat hesitantly because of the cows, we screened the first few trees. “Yes, I got one!” Finally. We thought this trip was cursed, since until today we had found exactly one fresh lady beetle. The good news was that this single specimen was indeed infected by Hesperomyces virescens, the parasitic fungus we were looking for. Hesperomyces virescens is an ectoparasitic fungus that targets lady beetles (Coccinellidae). There is no common name for this fungus (a suggestion, anyone? ), so we’ll refer to it as H. virescens in the rest of this story. The fungus parasitizes a wide array of lady beetle species, in many different genera spanning even different subfamilies. 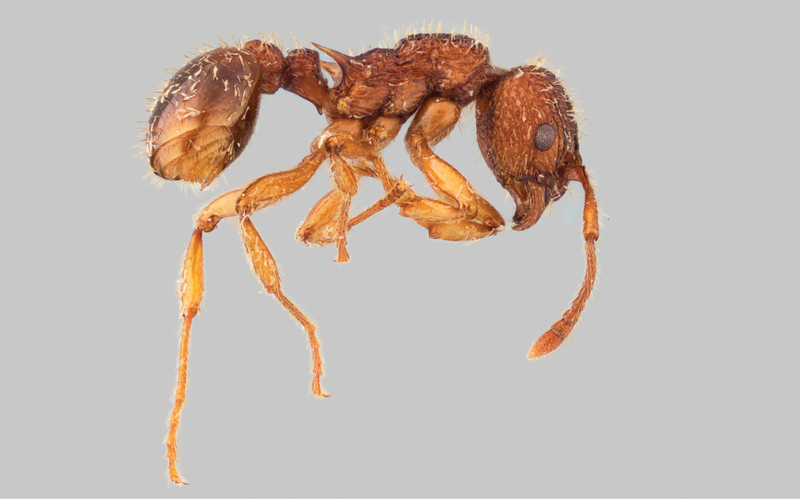 Considering that such a small organism (the fungus measures 150-500 µm in length) that is widely distributed, both in terms of hosts and geography, led us to speculate that it actually might be a diverse complex with multiple species masquerading as a single species. To test this idea, more than simple morphological data and tools are required. We need DNA from fresh material for phylogenetic analyses. Although the fungus grows on many different species, its “main” host species is Harmonia axyridis, an annoying invasive lady beetle that, for many reasons, is considered one of the major threats to biodiversity on a global scale. Therefore, knowing all about its pathogens, parasites, and parasitoids could be key to the biological control of this pest species. This research idea brought us to Panama. The first part of the trip we hiked and climbed in the moist lowland rainforest on Barro Colorado Island, making use of the Smithsonian Tropical Research Institute (STRI) laboratory facilities, where we made late night observations of insects we collected during the day. We managed to find a lot of ectoparasitic fungi on leaf beetles (Chrysomelidae) from Barro Colorado Island; however, no lady beetles were found. Also in the insect collection at STRI’s Tupper Center in Ancón, we sought these little parasites of lady beetles; we found 12 infected specimens of a total of 212 lady beetles examined. Dried material is not a good basis for DNA extraction, so we were getting more and more nervous, because we had only nine days left to find fresh lady beetles for turning this into a successful trip. The final part of our trip brought us to Chiriquí, where we stayed at Juan and Mary Bernal’s place and worked with Juan and his colleague, Rosa Villarreal, professor of mycology at UNACHI. Eventually five of us—ourselves, Juan, Rosa, and one of their undergraduate students, Leila—ended up that Sunday morning in the orange grove with the cows. No one could identify that first lady beetle we found. Later, in the lab, we determined that it in fact was a new host for H. virescens. Interestingly, we did not find any Harmonia axyridis in Chiriquí. This might mean that this invasive species has not yet arrived in Panama. If this were the case it gives scientists a unique opportunity to follow in real time the cascade of events that happen after establishment of the beetle and it parasite. Only through such observations can we fully understand the interplay between host and parasite. This work cannot be accomplished without collaboration. 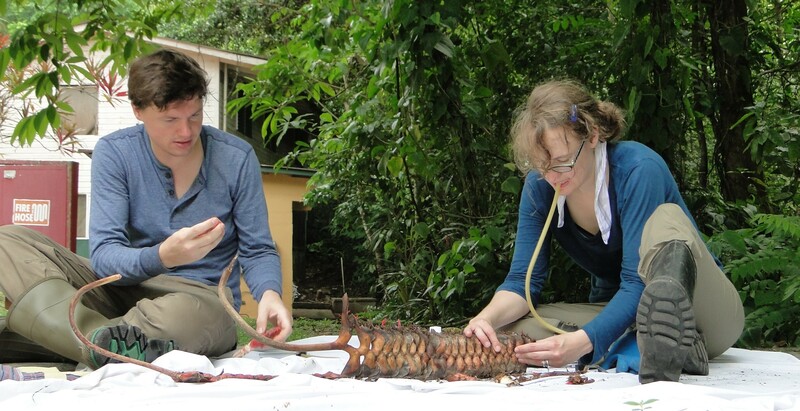 For this reason, we will stay in close contact with Juan and Rosa, thanks to a collaborative grant, which will further strengthen the work on these fungi both in the United States and in Panama. Panama, we will be back! Thanks are due to María A. Fuentes C., Juan, Rosa! Posted on September 8, 2016 by Danny Haelewaters. This entry was posted in Biodiversity, Laboulbeniales, Mycology and tagged Coccinellidae, Hesperomyces virescens, Laboulbeniales, Panama, PhD thesis, Smithsonian Tropical Research Institute, UNACHI. Bookmark the permalink.